This past weekend was Caleb's 13th Birthday! He invited 8 boys for his party! A night of fun, food and video games. Since Caleb is 13 ~ Dawn had no idea if she should make treat bags for the boys. Is 13 too old or are we ever too old for treat bags? Posting the question on Facebook she received some very good suggestions and the majority of readers felt that no age is too old for treat bags. When we left to go shopping on Friday for party items we had no idea what we were going to do for treat bags. While shopping at the Dollar Store for plates and napkins for the party we found great water bottles. Right away we thought they would make great party treats! Water Bottles made in the USA and BPA Free. 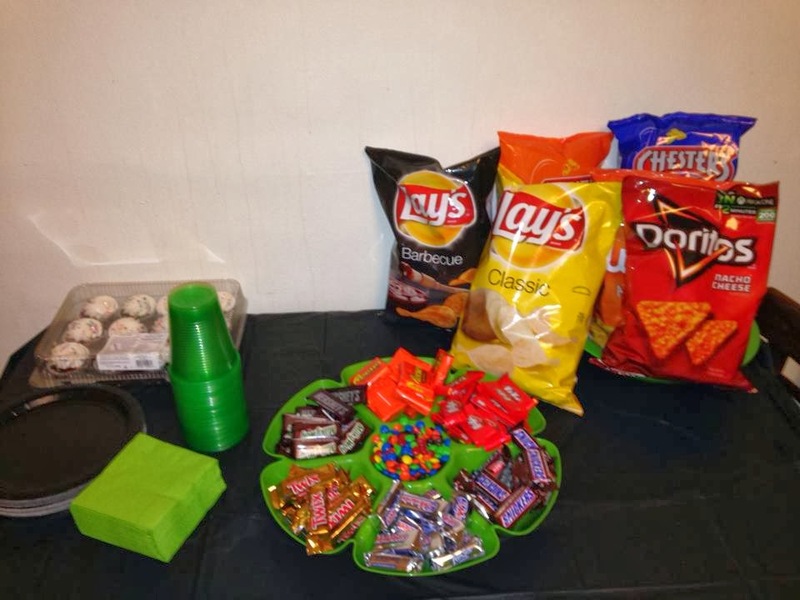 Since Call of Duty was the theme for Caleb's Party his colors for his party were Black and Lime Green. The bottle color was perfect. We then went to the grocery store and bought treats to fill the bottles. We looked for tall items like sugar straw and pops on sticks. We also added flavor packets to add to the water. The bottles made great treats! 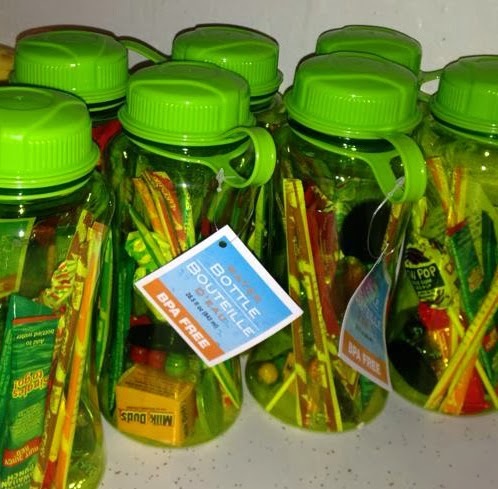 What is even nicer is that we were able to make 8 treat water bottles full of treats for $15.00 less than $2.00 a bottle! Great treat for any party! To be 13 again! Chips, Candy, Soda, Pizza Rolls and Cupcakes! His party was a huge success! Fun night with 8 boys! WOW!!! What a night to be a MOM! Dawn was totally exhausted! Oh my gosh! You are totally my new Parentidols. I MUST do this for my sons next birthday. What an awesome idea. I always try to think of something new and neat to do at my kids birthday parties. I have pretty much set the theme for kid birthday party ideas in our family since I birthed my kids - I just absolutely love putting together my kids parties. That water bottle idea is fantastic. Sounds like a great party! I love this party favor because it is within a product that kids can actually use, and enjoy! This is such a fun favor idea. I like that it's something that can be used long after all the treats are gone. What a great goodie "bag" idea! Love that you can use the bottle over and over again and that they are BPA free! I like that you made treat bags with water bottles and they can reuse the bottles. So much better than a one time only treat bag! I'm sure they all loved them. I love this idea so much! Totally pinning. What a great party treat! Not only do they get goodies inside, but they have something that will last a long time. That is such a great idea. I love it so much more than goodie bags. That is such a great idea. Very cheap too! Now this is an idea that I would use for my own kids and their friends. I definitely would have been like you trying to figure out if 13 was too old for this or that. I guess I would have to listen to my kids and what they are saying around then too. :) Sounds like you got some great advice on Facebook. I'm glad it was a hit! I love this idea for party favors! We might do something like this for my sons birthdays! That is a cute way to give out party favors instead of the bags - they can be reused over and over again. What a great idea! I never thought to use water bottles at gift "bags" haha. Why didn't I think of that before? What a perfect party favor idea. That is such a great idea. I have three kids that are in their teens, but I am still a birthday planning mom. This is definitely a great party favor for older kids. I am busy planning my oldest daughter's sweet sixteen. I could use some tips.